Yatsugatake is a beautiful mountain area located at the border of Nagano and Yamanashi prefectures. It is a place which is worth visiting in any of the four seasons. Yamanashi is famous for its fruit picking sites. The orchards of this area provide opportunities to taste self-picked seasonal fruits like cherry, strawberry, apple, grapes and etc. All the four seasons adorn the Alps mountain ranges and the surrounding areas with beautiful decorations of nature. The hottest summer season provides a cool atmosphere at the valleys and it is quite a nice experience to enjoy the fruit picking at this place in this season. Also, it’s an unforgettable journey and to fulfill you with evergreen memories. We stopped at Yatsugatake Kogen Lodge for a lunch. 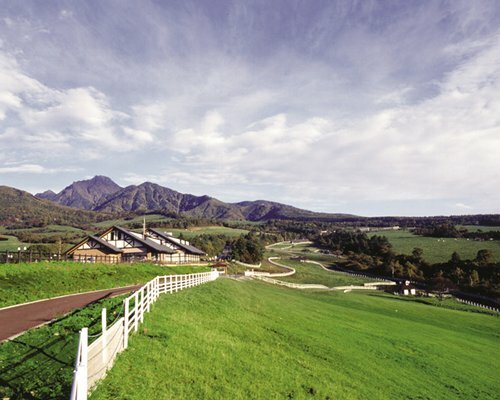 Located in Minamakimura, this lodge is famous for its French cuisines. Japanese and Western dishes are also served there. The atmosphere and the surroundings of the lodge area were really fantastic with greenery all around and the beautiful western style furniture inside it. Even in the rain, the beauty of this area could be enjoyed at its most from inside the restaurant. The restaurant is spacious with western outlook and furniture settings. A journey to Yamanashi’s Yatsugatake for cherry picking was really enjoyable and we could eat a lot of cherries, one of the most delicious fruits of the season. The cherry trees with their branches extending on both sides, like the open arms of a tall person, with the reddish bulb-like cherries hanging from them really turned our mouths watery. The ticket is a little costly, but the enjoyment and the taste of the cherries are still priceless. Along with enjoying the taste of the cherries picked by ourselves, the sight of cherry trees all around with lots of red berries hanging from them is really a feast for the eyes. Unlike the strawberry picking, the cherry picking was more enjoyable and we could eat a lot of fruits even at the end of the allotted time. Cherries trees are tall and if we couldn’t pick up every cherry, there are people standing there to help us pick the fruits from the top. We can even ask them to pick cherries for us and they will climb up the ladders to the top. Eating cherries freshly picked from the trees with its entire taste without losing any, makes us want to stay there for longer time and we couldn’t stop eating. There are various varieties of cherry trees: big and small sized fruits, various tastes and so on. A handful of freshly picked cherries looks really cute and gulping one by one will not feel the time passing. There are special places inside where we can spit out the seeds of cherry fruits, otherwise we have to keep the seeds in a plastic box. After the picking, we may buy different varieties of cherries from there. Cherries are grouped based on its size and quality and packed in 1kg boxes. The price ranges up to 5000yen and even more per kilogram based on the cherry type. On the way, we visited the Seisen ryo in Kiyosato area which was built by Dr. Paul Rush as a dormitory for the Christian missionaries. The beautiful area with the building facing the great Mt. Fuji is an awesome view. There are a number of buildings with sloping roofs in red colour which attract the visitors’ attention from a long distance. The main building has a cross shaped as X mark at the front and there is a statue of Dr. Paul facing the Fujisan. Now the Seisen Ryo has accommodation facilities, restaurants and hot springs inside. Shops in this place are famous for the soft-served ice-creams and the Jersy milk. Seisen Ryo’s soft-served ice-cream is very famous. They have their own Jersy farm named ‘Seisen Ryo Jersy hut’. The special ice-cream and other products sold there are really delicious.